I developed de Quervain's after my son was born, it is actually quite common with new mothers. It can also show up with gamers, guitar players, texting and other repetitive hand motions. Patients often report that the pain is agonizing. Not only is the pain intense, but there can also be a loss of functionality. This loss of function with a new baby is what inspired me to look for alternative treatments. Western medicine only offers treatment options of NSAIDS, steroid injections and/or surgery. These options didn't work for my long term systemic health goals and my immediate need for functional hands, as a new mother. For patients looking for options, we treat this condition with electro-acupuncture, dietary therapy and herbal medicine. Everyone responds differently to treatment, and Chinese medicine does not have a one-size-fits-all approach. I used a combination of electro-acupuncture, dietary therapy and herbal medicine. Repetitive movements stressing the tendon combined with runaway inflammation can create the perfect storm. 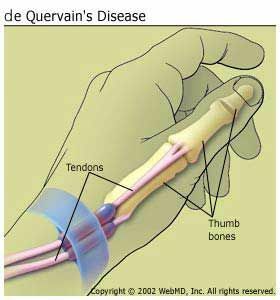 De Quervain's tenosynovitis or disease is an inflammatory condition which can present with wrist and thumb pain. It often presents with swelling or crepidus (crunchiness). It is painful with movement of the thumb. The diagnosis is a very simple test. It can be painful. This simple video shows how to test. Never tell a runner not to run!